The Martin Mania EF1i is the first fixture in the new amazing Mania series. The EF1i has cool dance floor lighting effects suitable for DJs, clubs, events or even your own personal party. With 19 beams of light, a manually selectable gobo wheel and 8 patterns, (each with color), the Martin Mania EF1i will decorate and electrify any environment. A variable focus also allows you to frost any effect and an optional sound activation keeps patterns moving to the beat. Best of all is the Martin Mania EF1i’s incredible capacity for stamina. Unlike most lighting fixtures on the market the EF1i has no duty cycle, which means there are no cool down periods and no stopping the show. There are few things more irritating than having to stop a groove you have worked for hours to get going simply because your lights need a rest, and with the Mania series, this is a thing of the past. 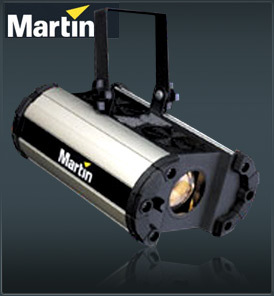 Utilizing the lighting know-how of the total Martin experience; from clubs to stadium concerts, in the Martin Mania EF1i our R&D team have put together a fixture that not only out prices its peers, but outshines them in brightness, clarity and functionality, and all for the most revolutionary prices seen. Through the opening another, solely owned, high tech production facility in China, Martin is able to produce the Martin Mania EF1i below the cost of its competition. Giving you a clear passage to the tools you need to color your show, club or party.